note: This article was written by Allan Carrasco, for any use or reproduction of this article please adresse him. 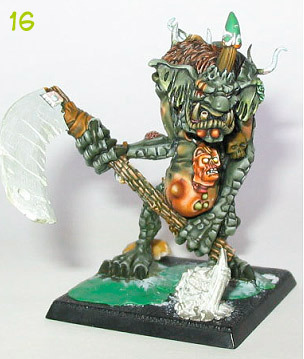 All the painting seen in this article was also done by Allan C. This article was translated from french to English by Arthur Muguet ( FrenchKid) Nurgle Troll The birth of a refined creature This tutorial will only cover the painting phase of the mini and not the conversion, which is anyway not very complex. 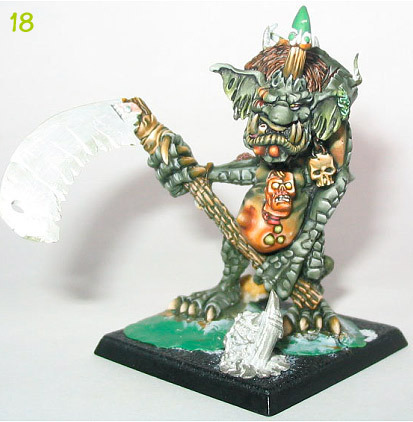 A picture of the unpainted mini… green stuff has a strange color in picture… The first step is to apply the undercoat, a citadel skull white spray primer was used a couple of time at a distance of about 20 to 30 cm. I always start (or almost always) by painting the dominating color of a mini, which I feel it’s the most logical thing to do. 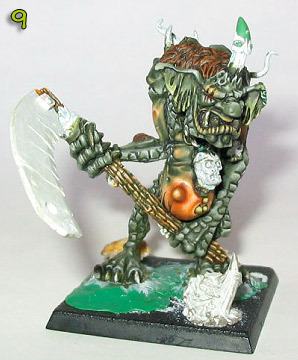 On this mini the dominating color is the skin. 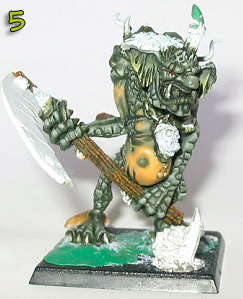 I painted it in catachan green, 2 or 3 layers where necessary to cover the undercoat. (Picture 1) I then passed about 2 or 3 times a wash of catachan green and chaos black (photo 2) The wash of course allows to shade but also to define the details of the skin such as the scales, this will allow me to place my highlights correctly afterwards Note: Starting in picture 2 you can see that the end of the horn is used.. that is the work of my fingers !! It’s one of my flaws in painting that I’m trying to correct, I can’t help but touch the mini, which can sometimes lead to disastrous consequences, especially knowing how fine the layers are. So I usually chose a “contact point” that I use to hold the mini and that I’ll paint last. I rarely use any supports, I paint directly on the final base of my mini. I then move on to the highlights, they are done by mixing catachan green and skull white, the white being added in quantities more and more important as I go on. 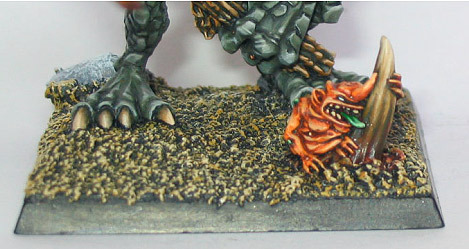 The pictures 3 and 4 show the completed highlights (even though I went back on some scales afterwards …) I then choose to paint the swollen stomach that is the pried of any creature worshipping my favorite chaos god. 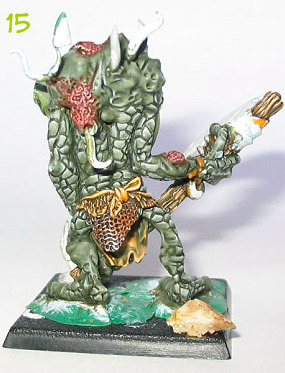 For this I used some bronzed flesh, also used on the muscles of the monster (picture 5 and 6). At that point details such as the staff or the inside of the ears are done. I then finish the skin with a couple of washes made of blood red and bestial brown, as well as some juices that are close to the consistency of a wash around the pustules. 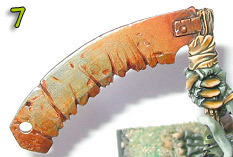 Then to create a blending effect, glazes of the same mix but with a lot more bronzed flesh are applied, which tones down the red shade as you go further from the pustules. 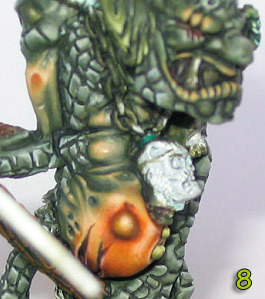 I then highlight lightly the skin of the stomach with a mix of bronzed flesh and elf flesh, and then elf flesh and finally some skull white. To finish the skin with the human skin color, I paint the face details such as the lips, the eyebrows, the gnawed ears, the shadows under the working eye, speaking of which, I applied the first layer on the eye with a mix of skull white and sunburst yellow. The pictures 7 and 8 show that part of the work. The staff of the scythe that I started on earlier is finished, it is made of a basecoat of snakebite leather, some washes of the same color mixed with chaos black and highlights made of snakebite leather and skull white, I add in more and more skull white as I highlight. A final wash of dark angel green is done in between the veins of the wood. I then do the fur on the back of the beast. The first layer is made of bestial brown followed of a wash of the same color to which I added some chaos black. 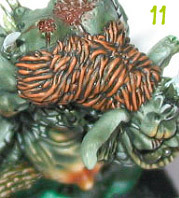 (Picture 9) The fur will then be highlighted by adding more and more bleached bone to the bestial brown. Pictures 10,11,12 and 13 show each new highlight. The face is well under way, the teethes are a blend of snakebite leather mixed with chaos black towards a mix of with and snakebite. The eye is highlighted and receives a pupil. The metallic parts such as the chains or the rings received a base of boltgun metal highlighted with chainmail and mirthil silver. 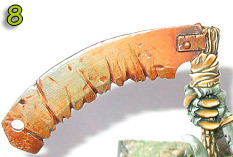 The rust is then applied in different places more or less accentuated to create a realistic effect. 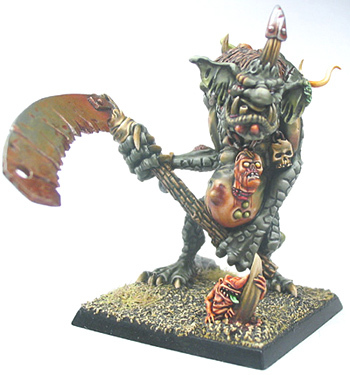 The head that is hanging from the chain is treated in the same way (bronzed flesh and same washes) (picture 14) The rags that the troll uses as clothing have a base which is a mix of snakebite and bleached bone, shaded with snakebite leather alone and then snakebite with chaos black. The highlights are done with some bleached bone and then a mix of bleached bone and skull white. The chain mail (I’m pretty happy with my sculpture and the waving effect I gave it) is treated exactly like the other metallic parts, except for the dark red (probably a blood stain…). 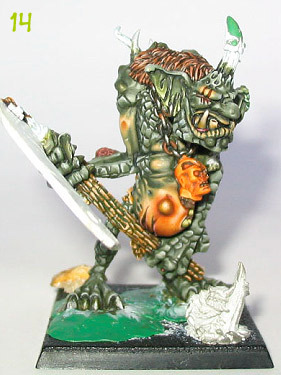 The scabs are made of a successions of red and brown washes, and then highlighted by adding skull white. 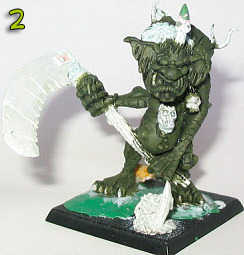 (Picture 15) I then finish the rotting head by highlighting the skin with some elf flesh and then a mix of elf flesh and skull white. The trachea and the inner flesh of the neck are painted with a mix of blood red and chaos black, they then receive a wash of a bit of blood red and a lot of chaos black. They are then highlighted using blood red and then blood red mixed with a tiny bit of skull white. The eyes are painted with a mix of sunburst yellow and skull white, highlighted by adding more and more skull white to the mix. They then receive a couple of glaze made of sunburst yellow and then sunburst yellow with a very little red. This gives them a very empty and glassy look. 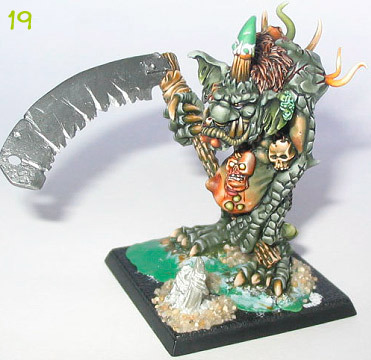 The pustules are painted in various shades of orange or green, the skull hanging from the chain, the horn, and the leather on the staff of the scythe receive a basecoat of snakebite leather with chaos black, then a first highlight of snakebite leather. 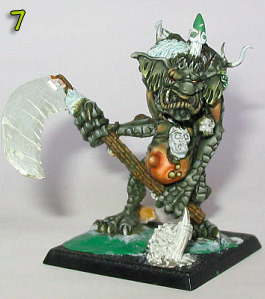 (Picture 16 and 17) The claws are painted exactly like the tooth, as well as the horn. At that point only some pustules, dorsal details, the scythe the base and the top of the horn (for the reasons mentioned earlier..) are left to paint (picture 18) Picture 19 shows the mini almost done. I still have the base the scythe and the top of the horn to paint. 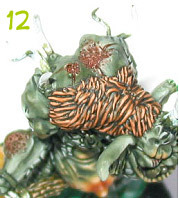 The small tentacles that are coming out of his back are painted either on a base of camo green highlighted with skull white, or on a base of bleached bone shaded with snakebite leather and bestial brown then highlighted with skull white (picture 19). The base gets some small stone (because he was nice ) [pagebreak] The scythe The scythe gets its own section, many people having asked me how I did it, I will explain how I made every details. It’s true that I’m pretty happy with the rust. 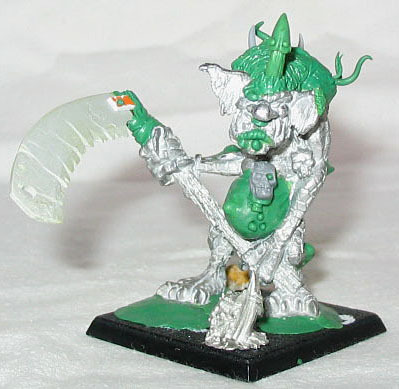 Note: When I sculpted the blade I made some gashs and some small crevasses on the side of the scythe, some when the milliput wasn’t dry yet. This is important for the finale aspect of the weapon; the paint makes them stand out and breaks the regularity. I first applied the basecoat of boltgun metal in 2 layers (picture 1) 2 washes of snakebite leather are applied on the whole surface (photo 2) I then apply a couple of washes of bestial brown, letting the tint of the snakebite leather show through (picture 3) glazes of bestial brown mixed with blood red and sunburst yellow are applied towards the edge of the blade, then some washes of the same mix are applied in the cracks and around the plaques that holds the weapon in place. (Picture 4) I then add chaos black to the mixture used before to intensify the cracks and the small depressions (picture 5) I then re-apply the same mix to which I add more red and a bit of chaos black (picture 6) I keep using the same mix and I intensify the proportion of blood red and chaos black (while keeping red the dominating color) and I pull out the color towards the edges, I also apply it in the cracks and on the cutting edge of the blade. Some dark red is added in the cracks (picture 7) The changes in picture 8 are few; I applied some highlights with a mix of mirthil silver and the preceding mix. [pagebreak] The base and the nurgling The base is inspired by Jakob Nielsen’s bases that I find amazing (tint wise) although simple… (And I thank him for having explained to me how he does them) The sand is painted in chaos black then dry brushed in bubonic brown and bleached bone. Jakob then applies washes of green and red, I don’t. 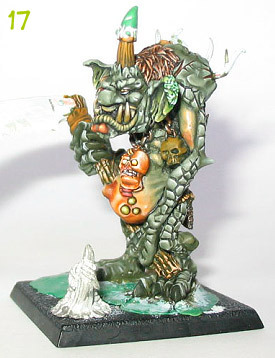 The base isn’t really finished, it’s missing some static grass, but I didn’t want the green one from GW, but rather a drier type of grass, and I haven’t managed to get some so far… The nurgling is painted in the same way has the stomach of the troll, with a bit more of a red tint. The tongue is in dark angel green highlighted by adding some skull white. 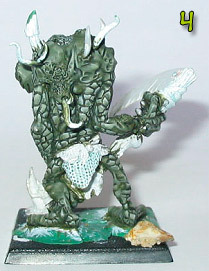 The horn is done in the same way the one on the troll was done; a red wash was just added to its base. The last touches are the painting of the sides of the base in black, the top of the horn painted like all the other metallic parts, then the application of a gloss coat where needed, which is on the pustule, tentacles, eyes, ect…. 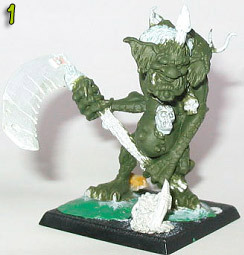 (See the finished mini). [pagebreak] The finished Mini !!! !